As explained in our post on International Women’s Day on 8 March, OEPS is presenting a poster and a presentation during this year’s Open Education Global Conference which is taking place in Cape Town from 8 – 10 March. 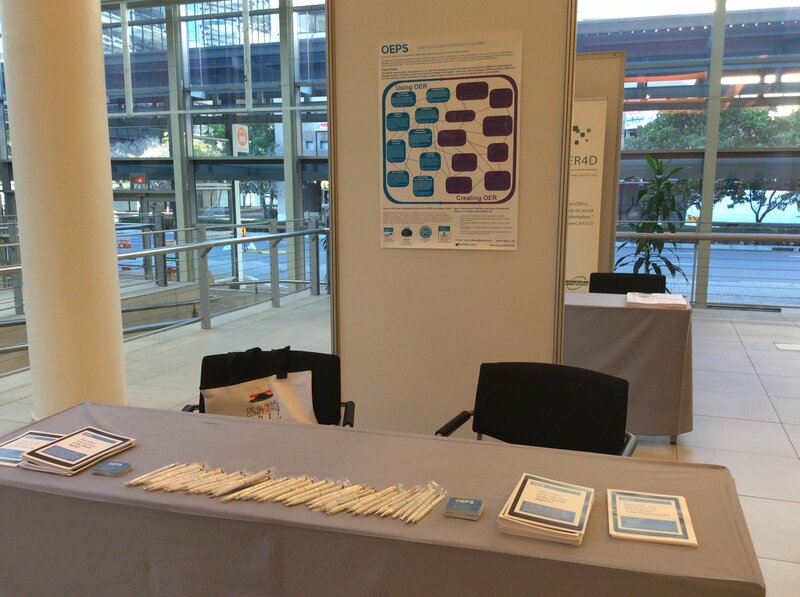 Today, 9 March, is the poster session with the OEPS poster covering the highlights of the Open Educational Practice case studies we’ve been gathering as part of this project. The Opening Educational Practices in Scotland (OEPS) project, funded by the Scottish Funding Council for 3 years, aims “to enhance Scotland’s reputation and capacity for developing publicly available and licenced online materials, supported by high quality pedagogy and learning technology” (https://oepscotland.org/). This means increasing the capacity of the Scottish sector to develop and use free open online content. On the OEPS hub website (www.oeps.ac.uk) the project has been compiling a growing repository of case studies illustrating open educational practice in different contexts. The case studies are real life examples of open education as practiced by different individuals in education and in the third sector, they explore widening participation, learning in the workplace, OER in schools, OER as a tool for enabling cultural and policy change, student support and the process of building OER in partnership. OEPS has been working with partners both within and outside the academy to create open educational resources. Some partners are using the OER they create as routes for continuing professional development of workforce, others are using them as an additional tool for teaching post graduate students specific topics within their field while others are using them for lifelong learning. Some of these OER creation partnerships have become case studies to illustrate to those new to OER and OEP how they might utilize OER for their context. In this poster we plan to highlight the thematic links between the case studies, the OER which OEPS has helped create and what they enable for the partners with whom the project is working to create open educational resources. The presentation is taking place on Friday 10 March and details will be shared in the next post. We are happy to announce our first newsletter of the New Year! Keep your eyes peeled for our new monthly newsletter, detailing all our latest activities. The call for papers for OER17 on the 5th and 6th of April is open, and the data for abstracts is looming, midday on the 16th of November as this “goes to press”. It is interesting to see politics in the title, as openness is seen “as a good thing” and there is often something oddly apolitical about the narratives around openness. Occasionally one sees a paper in the OER world that looks critically at issues of participation. They are rare, and can tend to look at simple causes like digital literacy, individualising exclusion, treating not knowing as a deficit, rather than exploring the causes of the causes, exploring; social capital, intergenerational aspiration, social and cultural barriers or underlying structural inequalities. These different readings of exclusion, from the individualised, through social to structural, stretch us, they insist we make hidden causes visible. Likewise, narratives on free platforms talk about creative destruction, disruptive innovation, or casualisation of work, of outsourcing of risk, how much for your data, and business models built on shareholders expectations of future value. Sometimes these things seep into discussion on Open Educational Resources and Open Educational Practices, but not often enough. After all, the promise was equity, not just equity of access as that is a plain numbers game, but equitable participation. This means taking a critical perspective on the rhetoric and the reality, looking at what this means for policy, in practice, and crucially pedagogically. I think this conference may be different, OEP is changing, maybe this is “when worlds (finally) collide”. However, it is only going to be that kind of conference if it attracts papers from the unusual suspects. From scholars working in widening participation, with “critical perspectives” on free and open, it is only through developing those creative tensions that OER and OEP can start to become political. So submit a paper. 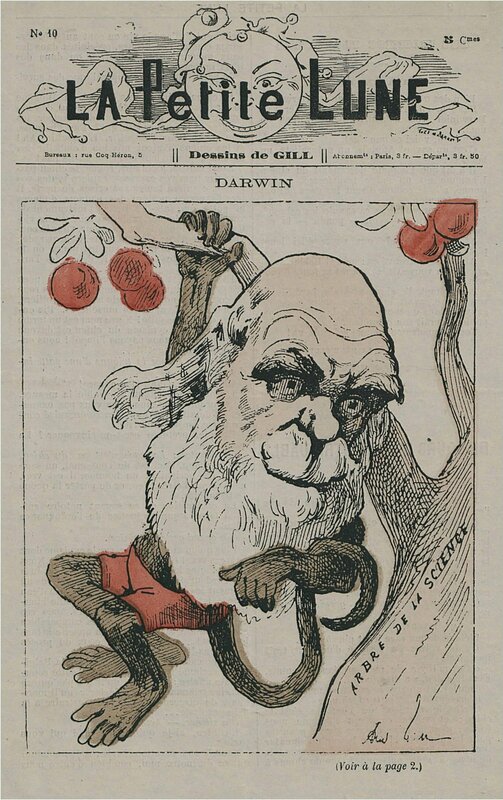 OEP is changing, is it a changing external environment and Darwinian adaptation through natural selection, or Lamarckian, passing on characteristics acquired during its life, or a bit of both? We are pleased and excited to announce that our open badged online course Becoming an Open Educator is now live on OpenLearn Works! Focussing on how free and open might change your approach to teaching and learning, the course is aimed at educators, facilitators and administrators across all sectors. The OEPS team collaboratively developed the course and the lead author was Beck Pitt. An earlier version of the course was openly peer reviewed. During Becoming an Open Educator you will discover how to find open resources and their benefits and consider whether they change the relationship to the content you create. You’ll also reflect on your own practice and what ‘open’ might mean for your own context. Who might use any open educational resources you create and what do you need to consider to ensure your resource is visible and re-useable? The course also explains how ‘open’ licences work in supporting open sharing and reuse and is full of lots of best practice examples of open practice and suggestions. The course includes a series of quizzes which count towards a digital badge. If you read through all the material in the course you will receive a Statement of Participation. Head over and check out the course! If you like what you see then please don’t forget to tell your colleagues and spread the word. If you are interested in exploring different ways you could reuse the course content with your peers, colleagues or/and students, please don’t hesitate to get in touch. We would also welcome any thoughts, comments and suggestions you have and would love to hear from you if the course has made a difference to your practice. Drop us a line (oepscotland [at] gmail.com) or tweet us and use the hashtag #openeducator when tweeting about the course. Want to help promote OEPS? Need a succinct outline of what the project aims to achieve? Looking for a printable summary of the project? Look no further! We are pleased to announce the launch of new flyer which summarises the project, the OEPS take on open educational practices and gives an overview of some of our key outputs such as the OEPS Hub and the OER we have produced with organisations such as Parkinson’s UK and SAMS. The flyer is also now available via our About page. These lists will be updated on a regular basis. The OEPS team contributed to the finale of the College Development Network’s Emporium of Inspiring Ideas on 17 June. We spoke to college staff about the use of open resources in the curriculum. The OpenScience Laboratory is an initiative of The Open University and The Wolfson Foundation. The online laboratory makes interactive practical science accessible to students anywhere and anytime the Internet is available. The laboratory features more than a hundred investigations based on on-screen instruments, remote access experiments and virtual scenarios using real data. As a project we are particularly interested in how free open resources like Open Science Lab are used in practice in the classroom and in the pedagogy and support that teachers and students require to get the best out of these resources. In 2015 we have a report of a pilot project using the OpenScience Lab resources in Scottish schools. We discussed the findings of the pilot project and what we’ve learnt more generally about good practice in the use of open resources in specific teaching contexts. The college staff we spoke to were unfamiliar with OpenScience Lab and the use of free openly licensed resources in the classroom. However, there was a lot of enthusiasm for thinking through how this kind of material can be used in college settings. We are looking forward to continuing this discussion at a workshop hosted by the College Development Network in the early autumn. One of the aims of OEPS project is to explore good practice through the co-development of exemplar OER courses. Two courses were launched in May. ‘Understanding Parkinson’s’ is a collaboration with Parkinson’s UK. It brings together the clinical and practical knowledge of the UK Parkinson’s Excellence Network with that of people living with, and caring for, people with Parkinson’s to produce a practical and useful course for health and social care professionals. The second course, ‘My seaweed looks weird’, produced in partnership with the Scottish Association for Marine Science at the University of the Highlands and Islands, takes recent research on global seaweed and makes it freely accessible to students and industry across the globe. #OEPSForum4 Online Registration is now open! The online registration for #OEPSforum4 on Wednesday 9 March 2016 at Stirling Court Hotel, Stirling is now open. The event is free of charge and lunch will be provided. 1B) Using OER – what does good practice look like? 2B) Using OER – what does good practice look like? This workshop presents an opportunity to discuss the strategic drivers, barriers and challenges to the use of OER and OEP within the formal and informal learning sectors. It is an opportunity to share experiences of OER and OEP and to consider what more could be done strategically and practically to increase their use. The workshop will contribute to the development of a draft strategic framework for OER and OEP in Scotland. Workshop B: Using OER – what does good practice look like? This will be a participative facilitated session that will provide the opportunity for open education practitioners from the formal and informal sectors to speak about their experiences of using OER and for everyone to ask questions, discuss and analyse the characteristics of good practice. #OEPSForum3 identified that one of the key challenges for OER and OEP is not just about changing practice but is also about changing institutional culture. This workshop will focus on how we can change institutional and organizational culture and will discuss some of the challenges in making use of Open Educational Resources and Open Educational Practices in your context. Learning takes place in a world that is permeated by digital technology. How well do we support the development of the basic skills that are required for participation in this world? How well do we understand the relationship between the skills for participation and the literacy skills required for effective learning in further and higher education?